The Scheduled Production By Month Report displays production for scheduled appointments by month and year for each provider. You can customize the default report as needed. On the Home menu, under Reports, click (or tap) Power Reporting. The Power Reporting page opens. On the Power Reporting page, click (or tap) the Scheduled Production By Month icon. The data from your database syncs with the reporting system automatically and displays the time of the last sync on the Data as of button. Data entered in Dentrix Ascend after the time shown will not be available on the report until the next sync. To view the time when the next sync is expected to occur, click (or tap) the Data as of button. 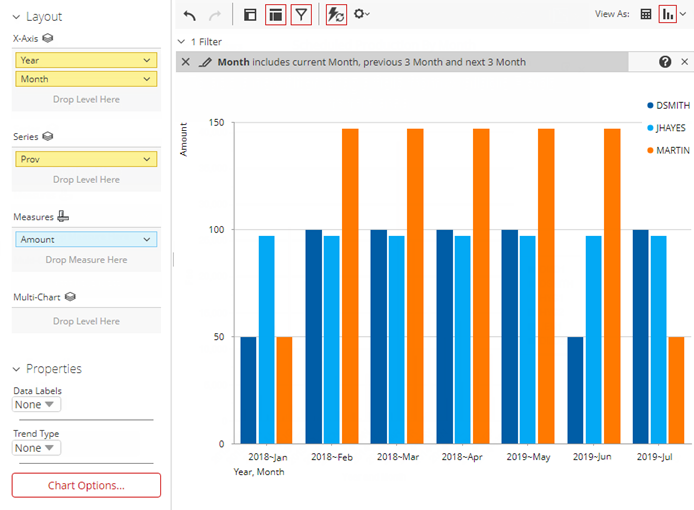 Using the analysis report builder tools, add data fields to the layout, and set up filters as needed. To save the report as a template for later use, click (or tap) Save. In the Save Report dialog box that appears, type a name for the report, select whether you want to save the report as one of your reports (available only to you) or as an organization report (available to all users), and then click (or tap) OK.
Click (or tap) an Export option from the More actions and options button menu to export the report as a .pdf, .xslx, or .csv file.